Ramón Roberto Hernández is a musicologist, Latin American contemporary historian, author, noted writer, and a photo journalist. His prominence is worldwide. He is the founder, collections specialist and author for the Hispanic Entertainment Archives and Research Center, the Hispanic American Entertainment Hall of Fame, the Hispanic Concert Hotline, Texas Star, Latino Star and StreetTalk magazines, respectively. His collections and expertise are acknowledged by the Smithsonian Institute and other noted historical preservation entities throughout the world. Ramón has made has also made a living as a publicist and Texas-based Latin music record promoter. As a publicist, he has taken virtual unknowns and turned them into household names. As a record promoter, Ramón has new artists and gotten their music to chart on as many as fourteen radio stations, which report to Radio y Música. As for community relations, Ramón was responsible for saving the Alameda Theater, the last Hispanic Theater in the United States, from being razed and turned into a parking lot. In addition to his extensive entertainment collections and research, Mr. Hernandez has received the “National Merit Award” from the Univision Television Corporation and has been honored as “Historian of the Year” by Centro Cultural de Las Americas in Fort Worth, Texas. He is presently curating several exhibits for the Wittliff Collections Department at Texas State University; and has assisted the Bob Bullock History of Texas Museum, the Institute of Texan Cultures, the South Texas Pop Cultural Center with artifacts. 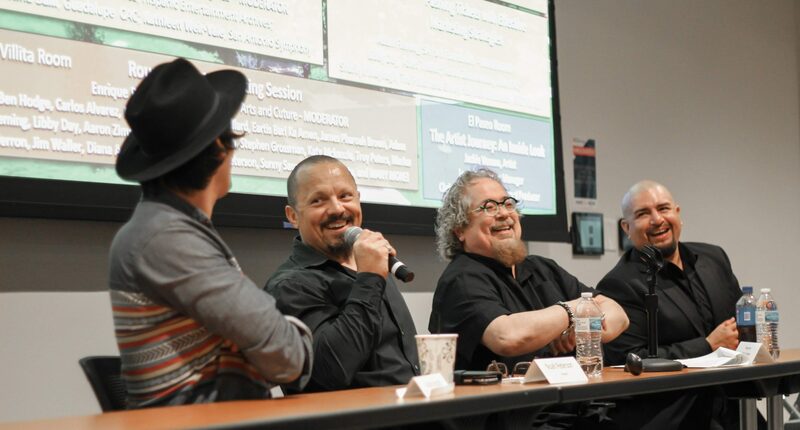 In addition, he is often asked to participate as a panelist on the history of Chicano/Tejano music. However, his knowledge extends to field of international Latino music. Ramón is also a consultant to several PBS Latin music documentaries produced by award winning film-makers Hector Galán and John Valadez. Last year, Bob and Kelli Phillips turned the tables on him when he became their subject for a segment on “Texas Country Reporter” television program. Do not miss Ramón Hernández at Music Biz Day on April 6th!